The small hill town of Urbino was a natural fortress, a fitting home for Federigo da Montefeltro, perhaps the most able military strategist of the Renaissance. 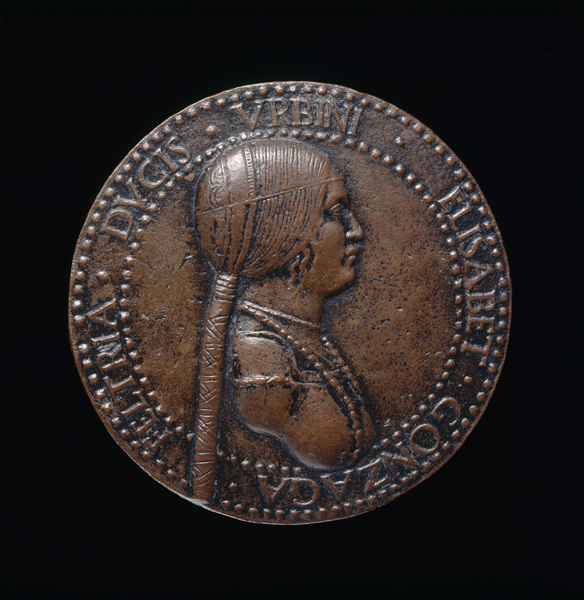 At the time of Federigo’s death, the duke of Milan had him under contract as a condottiere for the enormous sum of 165,000 ducats. The great warrior, however, used influence and income derived from armed conflict to transform his city into a center of humanist learning and culture. The buildings and public spaces he gave Urbino exemplify the clarity and proportion of ancient architecture as reinvented by the Renaissance. Humanist Paolo Cortese, writing in 1510, named Federigo and Cosimo de’ Medici the two great artistic patrons of his day. Among Federigo’s commissions may have been three famous views of an ideal city (in addition to this one in Baltimore, one is still in Urbino, the other in Berlin). They were meant to be set in wall panels at shoulder level or a bit above, producing the effect of looking out a window onto perfectly proportioned civic squares. They are masterful studies of perspective, with an almost airless clarity. None of the views is of a real place, although they include echoes of actual Renaissance and Roman buildings, such as the Colosseum seen here. The library Federigo amassed was one of the most impressive in all of fifteenth-century Italy. His household staff included four teachers of grammar, logic, and philosophy; five people whose task it was to read aloud during meals; and four manuscript transcribers who worked in the palace library. The marquis built two studies (studioli) where he could enjoy humanist pursuits, one in the palace at Urbino, the other in the nearby town of Gubbio (see A Room of One’s Own: The Studiolo). 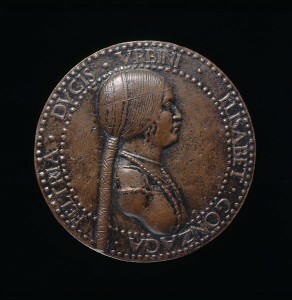 Rather than have himself portrayed in a grand equestrian monument like other condottieri, Federigo was depicted as both a man of action and a man of letters. 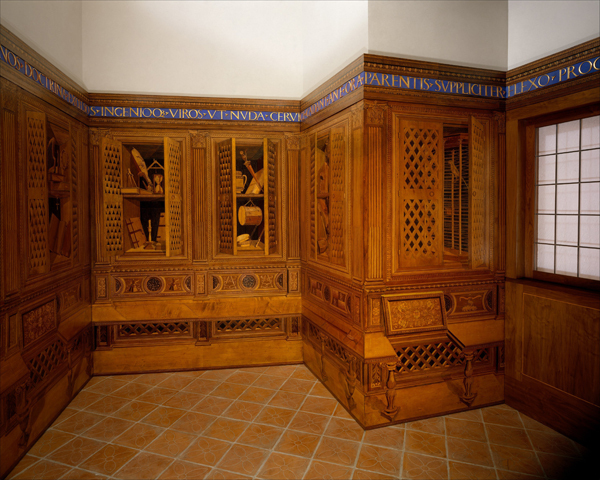 Federigo’s studiolo from Gubbio has been reconstructed at the Metropolitan Museum of Art in New York. Its elaborate intarsia was perhaps designed by Botticelli and Francesco di Giorgio; the latter was not only a painter and sculptor but also an architect employed by the marquis as a fortifications engineer. Trompe l’oeil cabinets and shelves are “piled” with objects representing different facets of Federigo’s interests and accomplishments. Arms and trophies allude to his prowess as a condottiere, celestial globes and other instruments to his pursuit of mathematics and astronomy. Musical instruments and books attest to his interest in the liberal arts. 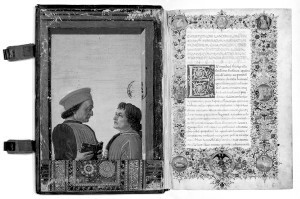 The ultimate reflection of Renaissance princely ideals, Baldassare Castiglione’s Book of the Courtier was set in Urbino, at the court of Federigo’s son Guidobaldo. The work consists of a series of imagined dialogues among real people, presided over by the duke’s wife Elisabetta Gonzaga. The assembled company discusses the characteristics of the ideal aristocrat, including his or her appreciation for art and learning.